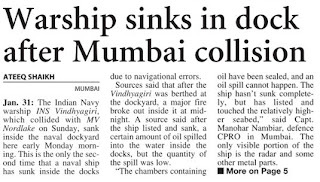 Tribune News Service Mumbai, January 31 The Navy warship, which collided with a merchant vessel yesterday afternoon off the Mumbai harbour, sank today. The vessel was carrying around 300 tonne of fuel and some of it spilled into the sea after the crash. Efforts were on to prevent the spillage from spreading, sources said. According to Coast Guard officials, the warship, INS Vindhyagiri, had suffered a severe damage to its hull, while there wasn’t much damage to the merchant vessel, MV Nordlake. According to the naval authorities, the warship was returning to the shore and had Navy personnel and their families onboard, besides some civilians. All of them were evacuated safely. The ammunition aboard the ship was also safely removed. Coast Guard officials said a fire broke out inside the ship around 4.30 am. Fire tenders were deployed, but the ship sank after catching fire, they added. The Captain of MV Nordlake told investigators that the merchant vessel veered into the path of the naval ship while trying to avoid a collision with another vessel. The mishap occurred near the Sunk Rock Lighthouse. Tribune News Service Chandimandir link * The accused, Ghanshyam Singh Guleria, was arrested from Chandimandir, Headquarters of the Western Command * Sensitive photos, clippings recovered from him * Police suspects that the ISI is targeting ex-servicemen, who have access to cantonments. Panchkula/Shimla, Jan 31 Following surveillance of several ex-servicemen, the Himachal Pradesh Police has busted a neat network built up by Pakistan’s ISI to collect intelligence on the movement, morale and activities in Indian cantonments. The HP Police picked up an ex-serviceman, identified as Ghanshyam Singh Guleria, from Chandimandir, Headquarters of the Western Command, on Monday. He is the third person in the chain to have been arrested by the HP Police, which earlier arrested Bhagwan Das, another ex-serviceman, and a resident of Mandi, Amrik Singh, who is accused of transferring money into the bank accounts of ex-servicemen’s relatives. Sources in the police claimed that surveillance had been mounted on 10 ex-servicemen, seven of them residing in Punjab and Delhi and the rest residing in Himachal Pradesh after their retirement. While Panchkula police was not taken into confidence before Guleria was picked up and taken away for interrogation, police sources claimed that the JCO had several clippings and important information about the Western Command in his possession. Police suspect that the ISI has systematically been targeting ex-servicemen, who not only have access to cantonments but who are also in touch with serving officers and jawans. Interception of telephone calls have led the police to conclude that the ex-servicemen were being approached by ‘Indians’, possibly also ex-servicemen, posing as working for various welfare agencies of the services. Military Intelligenge had also issued an advisory to ex-servicemen and cautioned them that they could be approached by other ex-servicemen for information. Guleria had retired last year but continued to reside in the cantonment. He also managed to get re-employment with the Army Postal Service. Similarly, Bhagwan Das had retired from the Army and was re-employed by the Animal Husbandry department of the Himachal Pradesh government. Significantly, Bhagwan Das has been receiving calls from his handlers from a SIM card issued by an Indian telecom company but which had not yet been activated. Technical experts have been called in to unravel the mystery. Tribune News Service New Delhi, January 31 A war of words has broken out between the Navy and authorities of the Jawharlal Nehru Port Trust (JNPT) at Mumbai over yesterday’s incident wherein Naval warship INS Vindhyagirihad collided with a merchant vessel. The Navy officials at the headquarters today said blaming anyone for the mishap was “premature” as a probe would establish who was at fault. INS Vindhyagirihad capsized following a collision with private merchant tanker MV Nordlake last evening off Mumbai coast. The Naval ship is as good as lost as the cost of salvaging it and refitting it will be much more than the future usage of the warship that was anyway slated to de-commissioned in three years. The Navy has registered an FIR and the merchant vessel and it crew has been detained for questioning. JNPT officials were quoted by a section of the media as having blamed the Naval personnel for the incident. 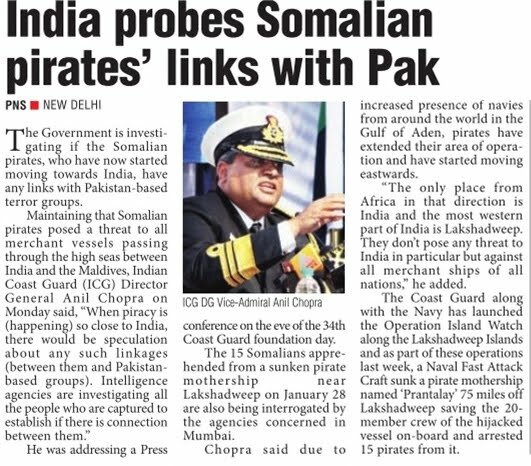 An inquiry was ordered by Director-General (Shipping) SB Agnihotri into the incident while the Navy has ordered its own probe. Naval spokesperson Commander PVS Satish said Naval ships had multiple radars and sailors standing on either side while merchant vessels did not have the same number of radars or people. “Statements blaming the Navy were premature,” he said, adding that the probe could take upto 8-10 weeks. 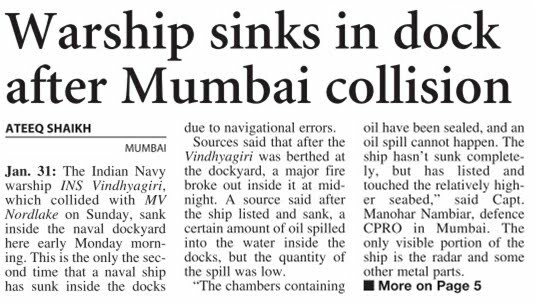 The collision had led to fire and flooding on board INS Vindhyagiri. Ammunition on board was cleared and there was fire raging in the engine room. The sea being shallow near the port, the bottom of the ship had touch the sea-bed and a portion of the ship is out of water. Necessary measures have also been taken to prevent any spillage of oil from the ship. Other naval operations and commercial operations in Mumbai port have not been affected. by G. Parthasarathy During the years of the Cold War, US-Soviet summits were dominated by discussions on issues like arms control and Cold War rivalries. Bilateral economic ties were virtually non-existent. The two superpowers had little to discuss on the global economy. With the US and China closely tied together economically, the major focus of attention in Sino-US relations is on trade, investment, market access and exchange rate mechanisms. This is even more necessary now with the ongoing economic crisis engulfing the Western world, the American trade deficit with China in 2010 being estimated at $280 billion and with OECD countries unable to fashion a unified strategy to confront the crisis they face. The Obama-Hu Jintao summit on January 22 was aptly described as a meeting between a still dominant, but fading superpower and an ambitious rival “with suspicion on both sides”. China’s economy continues to boom, recording a growth of 10.3 per cent in 2010. China has spent over $100 billion in aid to developing countries during the past few years — exceeding the aid given by the World Bank. Chinese aid is ostensibly without strings, but is mercantilist and focussed on acquiring natural resources in recipient countries. The United States, on the other hand, is mired in an economic crisis with unemployment reaching 10 per cent and a budget deficit estimated at 10.64 per cent of the GDP. Moreover, the wars in Afghanistan and Iraq have drained the US Treasury, strained its ties with the NATO allies and resulted thus far in the loss of an estimated 5,900 American lives. These conflicts have also resulted in the killings of 6,55,000 civilians and displacement of 4.2 million people in Iraq. The Afghan civilian deaths in the conflict are estimated to be between 14,643 and 34,240. American credibility and prestige have suffered heavily due to these military misadventures. If the Americans have miscalculated in military adventures abroad, the Chinese also seem to have been afflicted by hubris in recent years. In 1991 Deng Xiaoping advocated a strategy of “hide your strength, bide your time”. Ignoring this advice, the Chinese have also been flexing their military muscle in recent years, resulting in their hitherto docile neighbours getting seriously concerned. China has aggressively sought to intimidate its neighbours, ranging from Japan and Vietnam to Indonesia and India, with strident and unilateral claims on its maritime and land borders. Following the 26/11 terrorist strike in Mumbai the Chinese media went ballistic, threatening to invade and takeover Arunachal Pradesh, if India retaliated against terrorist havens. Assertions of friendship and partnership from the incoming Obama Administration only increased Chinese “assertiveness”. With President Obama accepting that Taiwan and Tibet were areas of “core interest” for China during his November 2009 summit, the Chinese went a step further and declared the entire South China Sea as an area of “core interest”. Territorial claims in the South China Sea were enforced using maritime power. The visiting Commander of the American Pacific Fleet was told that the Americans should recognise the western Pacific and the Indian Ocean as China’s sphere of influence. The Chinese vehemently opposed joint US-South Korean military exercises in the Yellow Sea after North Korea provocatively torpedoed and sank a South Korean naval vessel. China has behaved provocatively with Japan in disputes in the East China Sea over Senkaku Island and in differences over drilling rights in the contested areas. China even went to the extent of suspending the export of rare earth materials to Japan. President Obama appeared more than ready to bow to Chinese demands during his November 20009 summit with President Hu in China. Apart from conceding that Taiwan and Tibet were areas of “core interest” to China, Mr. Obama pointedly avoided meeting the Dalai Lama before his visit and avoided a reference to “human rights” while in China. When China became increasingly belligerent, American silence led to US allies like Japan and South Korea feeling abandoned. President Hu brushed aside American concerns on currency and other economic issues during the G20 Summit in Seoul. In the face of this Chinese assertiveness, ASEAN moved to expand membership of the East Asia Summit by inviting America and Russia. It was only during the AEAN Summit in Hanoi that Hillary Clinton voiced disagreement about Chinese policies in the South China Sea. With growing domestic criticism of his China policies, President Obama adopted a more assertive stance during the Washington summit. He spoke of the “universality” of “human rights” and religious freedom, compelling an evidently flustered Hu Jintao to concede that “a lot has to be done in China in terms of human rights”. Mr. Obama is also said to have urged his Chinese guest to enter into a dialogue with the Dalai Lama. The Chinese were persuaded to voice concern about North Korea’s uranium enrichment programme (developed thanks to the exertions of Dr. A.Q. Khan). After facing severe criticism in India for conceding a special role to China in South Asia during President Obama’s visit to China, which revived concerns of renewed Sino-US collusion directed against India, references to Afghanistan and South Asia were conspicuously avoided in the joint statement on President Hu’s visit. The Americans had perhaps belatedly noted that the Chinese nuclear and missile proliferation to Pakistan was vigorously continuing and that China had no intention of being on the wrong side of the Taliban in Afghanistan. In substantive terms, however, the Chinese made no concessions on monetary or other economic issues, but succeeded in keeping American corporations on their toes, holding out prospects for lucrative deals in future. It is evident that as Chinese economic and military power grows, the United States is going to be more circumspect and accommodating in dealing with China. The Chinese will, in turn, claim to be a “responsible power” by periodically responding positively to American concerns on issues like nuclear proliferation in Iran and North Korea. The Russians seem to be prepared to take advantage of this situation by extending selective support to the US on issues like their logistical needs in Afghanistan. These developments have created a strategic space for emerging powers like India, Indonesia, Brazil and South Africa to work with others to retain their autonomy on global affairs. Japan has already adopted a more assertive, China-specific defence posture. Naval exercises involving India, Japan and the US are scheduled to be held near Okinawa later this year and India is expanding security cooperation with Asia-Pacific countries like Japan, South Korea and Vietnam. Ministerial-level exchanges on economic issues with Taiwan could perhaps be initiated. India has to show diplomatic dexterity in safeguarding its national interests in the emerging multi-polar world order. Anthony Shadid, David D Kirkpatrick, Kareem Fahim, New York Times, Updated: February 01, 2011 00:57 IST Ads by Google The Economist Magazine – 12 Issues for Rs. 500/- Subscribe Now or Miss out! EconomistSubscriptions.com Cairo: The Egyptian Army announced Monday for the first time that it would not fire on protesters, even as tens of thousands of people gathered in central Liberation Square for a seventh day to shout for the ouster of President Hosni Mubarak. The announcement came after the opposition dismissed Mr. Mubarak's cabinet reshuffle as inadequate and as concerns over violence were heightened by the presence of security police officers clustered near the square's entrances, their first deployment there in three days. Since the demonstrations began last Tuesday, Mr. Mubarak has stayed mostly out of sight, apparently intent on waiting for the protesters' passions to cool. But opposition organizers called for the largest demonstrations yet -- a "march of millions" and a general strike -- on Tuesday, and the Egyptian economy showed more signs of shutting down. Across the square, trepidation inflected the euphoria. Many protesters suggested that the coming days may be pivotal, as an inchoate movement struggles to maintain the pressure on an entrenched state. In contrast to previous days in the uprising, which were dominated by the young, the demonstrations Monday included a more obvious contingent of older, disciplined protesters and members of the Muslim Brotherhood. The Islamist organization, outlawed under the Mubarak government, has been playing a steadily larger role in the demonstrations, after holding back at the outset. The president appeared fatigued in a ceremony broadcast on state television in which he welcomed a new interior minister, Mahmoud Wagdy, a retired general, who will oversee the police. He replaced Habib el-Adly, who had been interior minister since 1997 and came under sharp criticism from human rights advocates for tolerating -- or even encouraging -- torture and other police abuses. Mr. Mubarak left several longtime associates in place, including the foreign minister, the minister of information and the defense minister. With the Internet still broadly disrupted, Egyptians gathered at mosques around the city for noon prayers and then marched by the hundreds and thousands toward Liberation (Tahrir) Square on Monday, passing groups of security police and soldiers, . "I brought my American passport today in case I die today," said Marwan Mossaad, 33, a graduate student of architecture with dual Egyptian-American citizenship. "I want the American people to know that they are supporting one of the most oppressive regimes in the world and Americans are also dying for it." "Come down, Egyptians!" chanted one group heading to the square, drawing men into their march from the buildings they passed. The group, led by older men, linked hands and kept to one lane of traffic, allowing cars to pass. At the square, they joined protesters who had stayed all night in defiance of a curfew that the authorities are now seeking to enforce at 5 p.m., an hour earlier. The numbers in the square appeared to exceed those of previous days, despite efforts by the military to corral the protesters into a narrower space. Army troops checked the identity of people entering the square and began placing a cordon of concrete barriers and razor wire around its access routes, news reports said. But there were no immediate reports of clashes with the protesters, who have cast the military as their ally and protector. As military helicopters circled overhead, demonstrators jabbed their fists in the air, chanting, "The people and the army are one hand." Witnesses in Alexandria, Egypt's second city on the Mediterranean coast, said police had returned to the streets there, though only in small numbers and accompanied by soldiers. At Cairo International Airport, a voluntary evacuation of Americans -- including dependents of government officials in Egypt, some diplomats and private citizens -- got under way on Monday with a flight to Cyprus and two to Athens, as passengers waited to board six more flights heading for other unspecified destinations described as safe havens, including Turkey, American Embassy officials said. International oil companies are closing local offices, evacuating nonessential personnel and family dependents, and telling their Egyptian employees to stay home, but most companies said there had been little impact so far on exploration and production activities centered in the Gulf of Suez, the Western Desert and the Nile Delta. ENI, the Italian oil company and largest foreign producer in Egypt, said it was operating its production fields normally. BP, the British company with considerable operations in Egypt, also announced that its production had not been affected. Apache Corp., the United States oil company with the greatest exposure in Egypt, said its production operations were normal. After falling on Friday, Apache's stock price recovered on Monday. One exception is Statoil, the Norwegian company, which said it had halted offshore drilling in the El Dabaa area west of the Nile Delta. The return of police forces to the street came as. Mubarak replaced his brutal interior minister, Mr. el-Adly. Protesters had called for his resignation last week as Egypt's widely reviled security forces cracked down harshly on protesters in Cairo and other cities. But some analysts dismissed Mr. Mubarak's cabinet changes as window dressing that did not even meet the protest movement halfway. "It is disappointing," said Gamal Abdel Gawad, of the Ahram Center for Political and Strategic Studies. "There was an opportunity to use this cabinet as the tool to reconcile with the opposition by bringing in political figures from the political spectrum. But now we are back to a government of technocrats. Many of them are very good and well-respected people, but the question now is about politics; it's not about policies." Israel, meanwhile, granted permission to Egypt to move two battalions of soldiers, about 800, into the Sinai Peninsula, which has been largely demilitarized since the two countries signed a peace treaty in 1979. The area is populated by armed Bedouin tribes that have posed a challenged to the Egyptian authorities over the years. Jerusalem was also reported to have called on the United States and a number of European countries over the weekend to mute criticism of Mr. Mubarak to preserve stability in the region, the Israeli daily Haaretz reported. But an Israeli government official, speaking on condition of anonymity following diplomatic protocol, said that the Haaretz report did not reflect the position of the prime minister, Benjamin Netanyahu. Mr. Netanyahu spoke cautiously in his first public remarks on the situation in Egypt, telling his cabinet that the Israeli government's efforts were "designed to continue and maintain stability and security in our region." "I remind you that the peace between Israel and Egypt has endured for over three decades, and our goal is to ensure that these relations continue," the prime minister said on Sunday as Egypt's powerful Muslim Brotherhood and the secular opposition united around a prominent government critic in hopes of negotiating with the Army for Mr. Mubarak's departure. The announcement that the critic, Mohamed ElBaradei, would represent a loosely unified opposition reconfigured the struggle between Mr. Mubarak's government and an uprising bent on driving him and his party from power. But it left open the broader question of how to manage the transition to democracy from American-backed governments like Egypt that have proven most adept at eliminating any vestige of it. Though lacking deep support on his own, Dr. ElBaradei, a Nobel laureate and diplomat, could serve as a consensus figure for a movement that has struggled to articulate a program for a potential transition. It suggested, too, that the opposition was aware of the uprising's image abroad, putting forth a candidate who might be more acceptable to the West than beloved in Egypt. In a collapse of authority, the police withdrew from major cities on Saturday, giving free rein to gangs that stole and burned cars, looted shops and ransacked a fashionable mall, where dismembered mannequins for conservative Islamic dress were strewn over broken glass and puddles of water. Thousands of inmates poured out of four prisons, including the country's most notorious, Abu Zaabal and Wadi Natroun. Checkpoints run by the military and neighborhood groups, sometimes spaced just a block apart, proliferated across Cairo and other cities. Many have darkly suggested that the government was behind the collapse of authority as a way to justify a crackdown or discredit protesters' calls for change. "Egypt challenges anarchy," a government-owned newspaper declared Sunday. "A Conspiracy by Security to Support the Scenario of Chaos," replied an independent newspaper in a headline that shared space at a downtown kiosk. 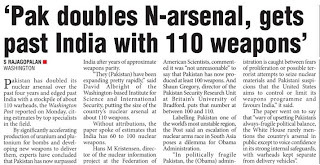 Press Trust of India / Washington January 31, 2011, 13:54 IST Pakistan has doubled its nuclear arms stockpile to 110 warheads, developing new weapons to deliver them and significantly accelerating production of uranium and plutonium for bombs to edge ahead of India. Islamabad's nuclear weapons stockpile now totals more than 110 deployed weapons in a sharp jump from an estimated 30-80 weapons fours years ago, 'Washington Post' reported. "Pakistan has expanded its nuclear weapons production capability rapidly", the Post quoted David Albright President of the Institute for Science and International Security as saying. 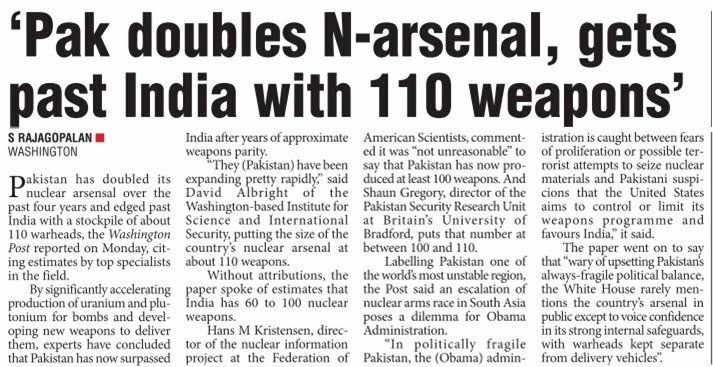 Albright said that based on accelerated production of plutonium and highly enriched uranium, Pakistan may now have an arsenal upto 110 weapons. The non-government US analyst said that while continuing to produce weapons-grade uranium at two sites, Islamabad has sharply increased its production of plutonium, enabling it to make lighter warheads for more mobile delivery system. Pakistan's has developed a new missile Shaheen II, with a range of 1,500 miles which is about to go into operation deployment. The country has also developed nuclear capable land and air launched cruise missiles, the Institute said in a new report. "The Pakistanis have significantly accelerated production of uranium and plutonium for bombs and developed new weapons to deliver them. After years of approximate weapons parity, experts said, Pakistan has now edged ahead of India, its nuclear-armed rival", Washington Post said. The paper said while Pakistan has produced more nuclear-armed weapons, India is believed to have larger existing stockpiles of such fissile material for future weapons. Dubbing Pakistan as one of the world's most unstable region, Post said an escalation of nuclear arms race in South Asia possess a dilemma for Obama Administration. It said in politically fragile Pakistan, the Administration is caught between fears of proliferation or possible terrorist attempts to seize nuclear materials and Pakistani suspicions that the US aims to control or limit its weapons programme and favours India. Quoting Pakistan's Defense attache at its embassy in Washington, Post said the number of Pakistani nuclear weapons are heavily deployed near its border with India. The paper said that in December 2008, Peter Lavoie, US national intelligence officer for South Asia, told NATO officials that "despite pending economic catastrophe, Pakistan is producing nuclear weapons at a faster rate than in any other country in the world". Mon, Jan 31 2011 18:39 IST | 76 Views | Add your comment FONT SIZE: AAA SHARE: Shimla, Jan 31 Himachal Pradesh Police have arrested a former Indian Army official who was allegedly working for Pakistan's Inter Services Intelligence (ISI) agency and providing information about vital installations of the Indian armed forces, a police official said here Monday. The accused, hailing from Palampur town in Kangra district, is a retired honorary captain, police said. “Acting on a tip off, S.S. Guleria was arrested from the Chandimadir area Sunday night,” Additional Director General of Police I.D. Bhandari told reporters. Chandimandir is the headquarters of the Indian Army's Western Command, located in Chandigarh. Bhandari said Guleria -- who retired from service last month -- was working for the ISI and was regularly getting money through illegal ‘hawala’ channels. He was arrested from his army quarters in the Western Command which he had not yet vacated. He was brought to Shimla for interrogation Monday afternoon. Before his arrest, police arrested Bhagwan Dass, another ex-serviceman from Kangra district Jan 27, who was also supplying sensitive information to the ISI. Amrik Singh, the prime suspect in supplying ‘hawala’ money to the ISI agents, was also in police custody. Both Dass and Guleria were getting money from Singh. Police suspect that Singh had given over Rs.1 crore to various ISI agents in the past six months. TNN, Feb 1, 2011, 12.51am IST NEW DELHI: The security situation in Suez Canal, the strategic gateway connecting the Red Sea and Mediterranean Sea, as well as maritime cooperation to battle terrorism and piracy figured in the talks between India and UK on Monday. "Suez Canal's security is obviously a top operational concern of navies,'' said visiting British Navy chief Admiral Mark Stanhope, who had meetings with defence minister A K Antony, Navy chief Admiral Nirmal Verma and Army chief General V K Singh, among others, on Monday. The ongoing upheaval in Egypt has heightened fears about the unrest adversely impacting the Suez Canal, one of the critical shipping shipping trade routes around the globe. Around 95% of international trade of both India and UK, incidentally, is carried by the sea. As for defence cooperation, Admiral Stanhope said UK and India were progressively building "interoperability'' between their armed forces as part of their long-term strategic partnership. There are plans, for instance, to increase the complexity and scope of the Konkan series of naval combat exercises which are held regularly between India and UK. 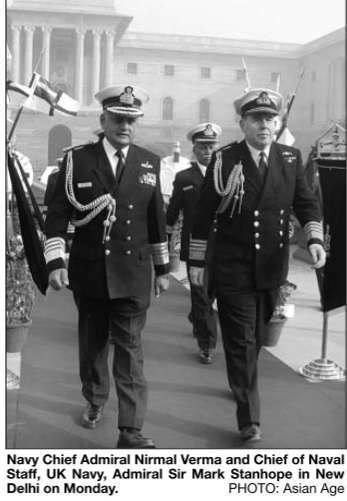 "We also talked about the capacity-building of smaller countries of the Indian Ocean Region (IOR) being undertaken by India,'' said Admiral Stanhope, adding that the security of the IOR will "naturally fall'' on India in the years ahead. The British chief is also slated to visit Mazagon Docks in Mumbai, which is currently building destroyers, frigates and submarines, apart from holding discussions with Western Naval Command chief Vice-Admiral Sanjeev Bhasin. Saad Duraiz 16 hours ago The Indian army exposes its corrupt officers, and we should do the same. The verdict is out: a court martial comprising seven lieutenant generals of the Indian Army has found Lieutenant General P K Rath, (former 33 Corps Commander) guilty of involvement in the infamous Sukna land scam. This will be the first time in the history of the Indian army that a serving lieutenant general has been court-martialled. All eyes are now on lieutenant general (retd) Avadesh Prakash’s court martial, the main accused in the scam. Another lieutenant general and a major general are facing ‘administrative action’ in the same case. Accountability: Indian style Ever since the case came into light in 2008, I have been following it with much interest. Needless to say it wasn’t free of the politicking and nepotism inherent to South Asian culture. The previous Army Chief General Deepak Kapoor had been dragging his feet on the results of a court of inquiry (CoI), since Lt Gen (retd.) Prakash was one of his top military aides. It was only after the interference of the then Indian defence minister that General Kapoor finally caved in and ordered a court martial. The current Indian Army Chief VK Singh who had headed the CoI back then recommended court martial for all four officers. Upon General Kapoor’s inaction on the recommendation, the rift between the two men became public knowledge. Incidentally, Gen Singh was the senior most lieutenant general of the Indian army and as per tradition (unlike ours) was the next in line to take over command of the second largest army in the world. The case was one of the primary challenges facing the new Indian army chief when he took over and the results are there for everyone to see. The Indian army has shown that it does not tolerate corruption amongst its ranks. Liquor smugglers and ketchup colonels Mind you, this is not the first time the Indian army has disciplined senior officers. In the past, generals have been dismissed on charges ranging from smuggling liquor to molestation. Of course, we still remember the ‘ketchup colonel’ who doused civilians with ketchup and submitted pictures of his fake ‘encounters’ with militants. The highlight in all these cases was not that the officers were indicted and punished as per the law of the land but that all cases were brought into public attention. This is exactly why I have been able to follow them and write about them today. On its part, the Indian army did try to remain tight-lipped about some cases but the media and the government proved too strong to allow that. When the army is 1.2 million in strength, it’s bound to recruit some unscrupulous men who will tend to harm the institution’s name for personal gain. Publicly announcing the censure of such officers sends a strong signal to both the military and the civil world. While it serves a strong reminder to those in uniform to keep in line, the civilians get reassurance that the institution is focused on maintaining professional integrity. Lessons for the Pakistan army We have never heard of a court martial of a general in our army - at least not on corruption charges. Recently word went around that a senior officer was disciplined and sent home. In 2007, when a UN report alleged that Pakistani peacekeepers had ‘aided and abetted’ a gold smuggling racket, the concerned officer was ‘stripped of his rank’ according to a western newspaper. So, when the army does indeed maintain a strict disciplinary code and punishes those crossing the line, why not bring the cases to the public’s attention? Contrary to what the military believes ‘maintain silence’ and ‘deny everything’ policies do more harm than a public disclosure would. This lack of transparency only adds to the debate that it is above the law in Pakistan. I may be too naive to understand the intricacies of Pakistan’s national security and how holding officers publically accountable may endanger it; but the way I see it, publically trying officers for crimes committed during service will herald it as a role-model for other institutions – something it strives so hard to be. The recent case of the NLC scam will prove as a litmus test for the army’s stance on tolerating corruption and misuse of authority amongst its ranks. It will reassure the public that army officers, too, can be held accountable under law as well as send a stern signal to those in uniform to keep their temptations in check. 2011-02-01 05:30:00 New Delhi, Jan 31 (IANS) French Army chief General Elrick Irastorza Monday arrived here on a three-day visit, seeking to ramp up defence cooperation and relations between India and France and initiate joint training programmes. Irastorza will meet Defence Minister A.K. Antony and the three services chiefs, apart from visiting an army formation during his stay here. 'The French Army chief will finalise the schedule of joint exercises between the two armies and is also expected to hold discussion on issues of mutual interest with the Indian defence top brass,' Indian Army officers said. India and France already have a robust joint exercise between their navies and the air forces. 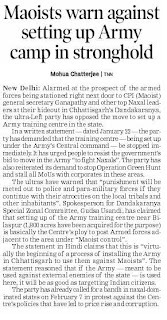 These will be followed up with the army-to-army exercises, they said. 2011-02-01 05:30:00 New Delhi, Jan 31 (IANS) The $10-billion tender for 126 combat planes the Indian Air Force wants to buy will progress unhindered as no secret relating to the deal was compromised due to a file which went missing recently, Defence Minister A.K. Antony said here Monday. 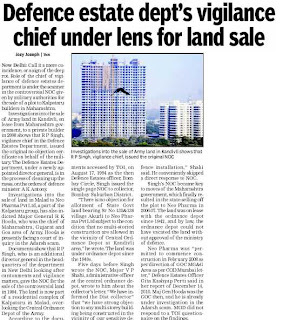 The file with details on the offsets proposal of the six competing aircraft manufacturers went missing in the last week of December 2010 and was later recovered from the roadside on Khelgaon Marg in south Delhi. Antony told reporters that the defence ministry and the air force's probe report maintained that 'nothing sensitive was compromised' from the secret file on medium-multi-role combat aircraft (MMRCA) and hence the process to procure the 126 fighter jets would continue. The minister earlier presented the Republic Day awards to the best marching contingents and tableaux in the parade 'We have received the (Defence Ministry) report. All the agencies including the air force have reported that nothing was compromised regarding the procurement of the MMRCA. So, hereafter MMRCA acquisition process will again start,' Antony said. 'It will take some time. Who will get the deal, I can't say now. The process has started again after the inquiry report was submitted and it will take a few more months,' he said when asked when the contract for the aircraft would be signed. 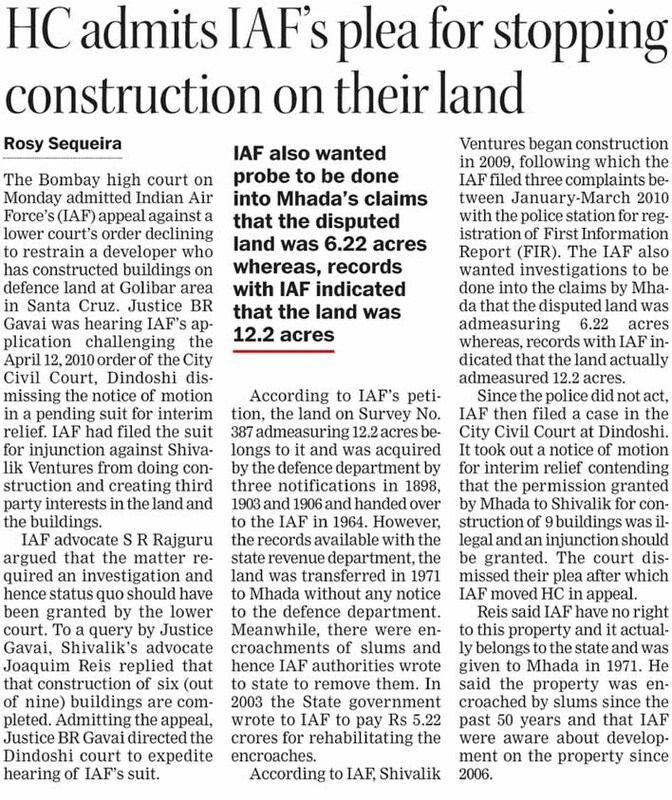 On the Adarsh Housing Society issue, Antony said the CBI had given a report in a sealed cover to the Mumbai High Court and that the defence ministry was waiting to hear from the investigating agency. He said the guilty in the scam would not be spared. 'That's why we preferred a CBI inquiry. The moment we get the report we will take action,' he added. 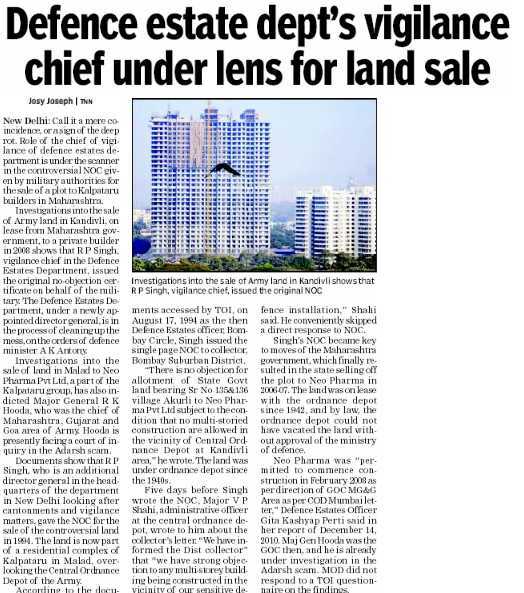 The 31-storey apartment building of the Adarsh Society had come up on army land in upmarket Colaba in Mumbai raising security concerns for the military establishments nearby. The CBI filed its first information report in the case Jan 29 in which former Maharashtra chief minister Ashok Chavan and several former army officers are named. Asked if he was satisfied with the punishment awarded by an army court martial to former 33 Corps chief Lieutenant General P.K. 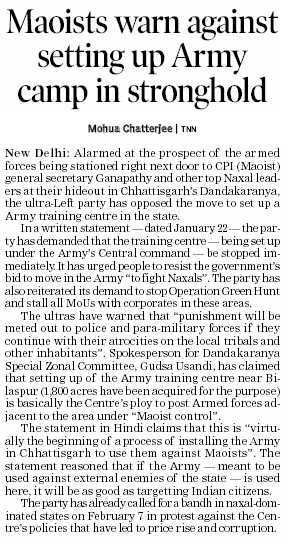 Rath in the Sukna land scam, Antony said: 'The matter is being dealt with by the army and unless I see the reports I cannot say anything.' 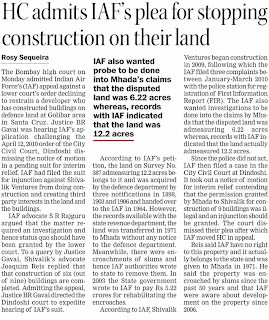 The court martial had awarded Rath loss of two years seniority, loss of 15 years for pension and severe reprimand for issuing a no-objection certificates to a private realtor to construct an educational institution on 70 acres of land adjacent to the Sukna military station.